The Russian Navy has significantly increased the number of underwater combat patrols. Russian submarines conducted almost twice as many combat patrols in 2015 as during the previous year, the Russian Navy deputy commander-in-chief, Vice-Admiral Alexander Fedotenkov, said on a Russian television channel last week, according to TASS. “Since January 2015 and up to now the time they’ve spent on combat patrol missions increased almost twice,” Fedotenkov stated. This comes on top of a 50 percent increase in the number of combat patrols from January 2014 through March 2015, TASS explains. Fedotenkov’s statistic is supported by Vice Admiral Clive Johnstone, commander of NATO’s Maritime Command, who said in February 2016 that Russia has been deploying its submarine force in the Atlantic Ocean at the highest levels since the end of the Cold War. 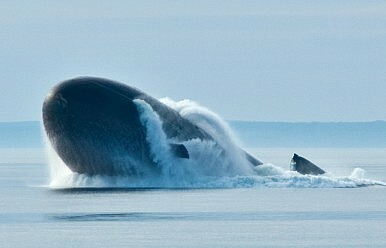 NATO sub commanders have seen “more activity from Russian submarines than we’ve seen since the days of the Cold War,” Johnstone said. This is “very different from the period of quiet submarine activity that perhaps we’ve seen in the past,” he noted (See: “Russian Submarine Activity at Highest Level Since Cold War”). Russian submarines currently patrolling the oceans “have longer ranges, they have better systems, they’re freer to operate,” he underlined. In addition, NATO has “seen a rise in professionalism and ability to operate their boats that we haven’t seen before,” explained the admiral. The Russian Pacific fleet is currently operating one Borei-class (aka Dolgorukiy-class), Project 955, fourth generation nuclear-powered ballistic submarines (SSBN) and is slated to receive another sub of the same type in August or September 2016. The Russian Navy also recently announced that its first Yasen-class nuclear-powered multi-purpose attack submarines (SSGN) has completed operational trials and will soon begin combat drills. “Operations trials of the [Yasen-class] Severodvinsk submarine are over and the submarine is ready to fulfill its designated missions. The Severodvinsk’s crew is currently completing measures necessary to put the submarine into service and to take to sea for planned combat training sessions,” a Russian military spokesperson told TASS.